Friday 27 May Tammay and I travelled to Belfast with Kelly for Heather and Eugene's housewarming. We flew from London City Airport and arrived at the Fitzwilliam Hotel in no time. We had dinner at Eipic. It turned out to be a long evening, even by tasting menu standards, so it was quite late by the time we finally had our last course. 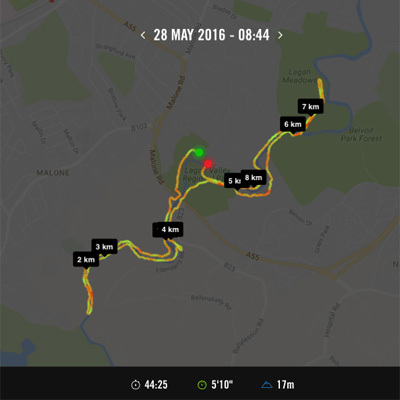 Saturday 29 May I was up early and met Eugene for a run along the River Lagan. I was still finding it hard to run (following an infection and holiday in Africa) but it was good to have Eugene pushing the distance a little. I was back at the hotel for breakfast in time for our tour of the north coast. 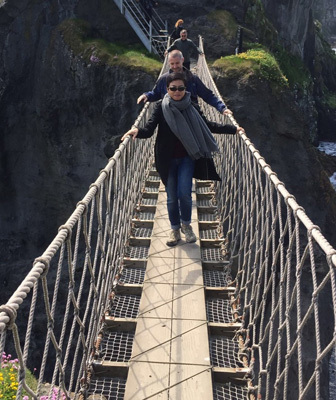 We headed out of Belfast to Larne and along the coast to the Rope Bridge at Ballycastle. 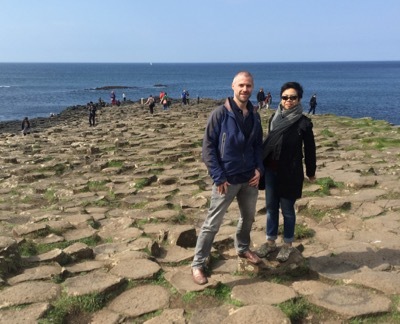 Our last stop was the Giant's Causeway. That evening we went to Heather and Eugene's housewarming. Sunday 29 May, our last day. We took a taxi tour of West Belfast. 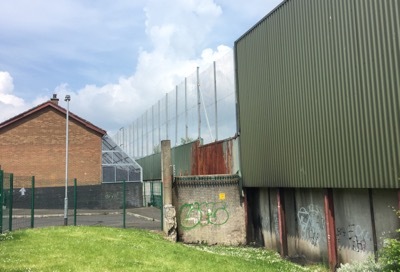 I hadn't realised the was still so much segregation between the catholic and protistans communities and had no idea there was a 25 foot high, 5km long, wall dividing Belfast. We visited the nationalist Falls Road and unionist Shankill Road areas. In this photo you can see the wall running behind a row of houses. The rear gardens of the houses are caged in to prevent any missiles coming over the wall from falling into the gardens. 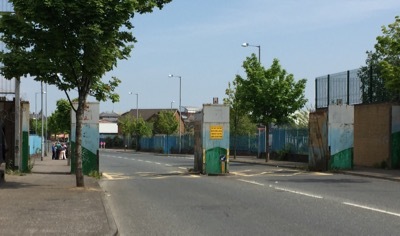 This photo shows one of the gates in the wall running through Belfast. These gates are typically open during the day but closed at night. Some are not opened at the weekend. 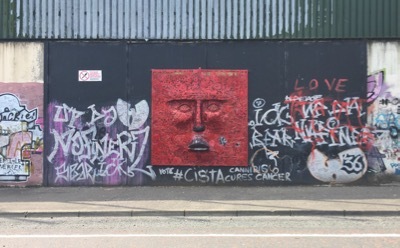 In many locations the wall is adorned with graffiti, art and murals. In this photo we can see one of the more artistic examples. The weather was glorious so paid a visit to Belfast's Titanic Quarter. In addition to visiting the Titanic Museum we also walked around the Titanic Quarter. We had lunch at a restaurant near the hotel before heading to the airport for our return flight.